Quite untill recently Kazakhstan was commonly identified as an impervious, legendary and fascinating place, one of passionate, bloody dusks whose natural beauty, combined with the landscape diversity, made it the most seductive country in Central Asia. Today, though these features still distinguish it, it is placed in the new global scenario with a fully renewed guise which makes it the jewel in the area’s crown. Over 20 years it actually managed to endow itself with its own structure and identity, doubtlessly more incisively and further reachingly than other ex USSR countries. This data may be even more appreciated if one considers its population, made up of only 17 million inhavitants, is subdivided into as many as 130 different religious confessions, which the state authorities were wisely able to harmonize, fleeing any attempt to ethnically-religiously characterize the Country. State modernization was also the fruit of smart economic choices, whose strategy did not stop on exclusively exploiting the huge energy resources available, but focussed on encouraging ambitious development projects based on the public – private partnership and attracting foreign investors tempted by the the privileged geographical position placing it near the greatest markets in Russia, China and India. This geographical peculiarity makes Kazakhstan a transcontinental State and also a potential logistic platform for exchange between Europe and Asia and, in particular, in this moment which is recording an epochal change in geo-political, geo-economic scenarios which the greatest powers involved are also responding to via creating and planning great infrastructural works. In fact there is no doubt that in the emerging context, continental infrastructures form an essential moment for upturn, as they can influence both the technological modernization processes and foreign policy stability. As well as broadening works in the Suez Canals and Panama, which have surely stressed the role played by maritime links, one must in no way ignore the importance of the land ones, which see the Asian continent as one of the main characters. Indeed, Asia – “pivot of the century”, which prof. Bajrektarevic describes as the place where “demographic-migratory pressures are huge, regional demands are high, and expectations are brewing” is the continent most interested in and involved by projects to create roads, tunnels and rail, infrastructures that should cross it from one strip to another. For example, China, which is playing a major role in this process, has for some years now got down to business, creating several strategic infrastructural projects that are useful in accompanying, protecting and raising the Country’s expansive capacities. This surely includes the great land and sea “New Silk Way” project, devised by Peking with the principal aim of moving China closer to the rest of the Euro-Asian continental mass, as well as developing the inland zones remaining behind the coastal strip. There can be no doubt that the full completion of this project will have weighty geo-political repercussions, if one just considers it focuses on linking Europe and Asia under an infrastructural, economic profile, and at the same time going against US replacing on the Atlantic and Pacific Ocean. In this new picture, Kazakhstan, already identifying itself as as “bridge” and joining land between the economies of Europe and Asia, finds itself back in the heart of a new East-West efficiency logistic axis represented by the current surge of motorway, Railroad and pipeline constructions. This looks to new, ambitious business opportunities, some of them already grasped by Italian firms (like Salini Impregilo and Todini), already busy creating one of these international transit corridors, while others could be profiled following the passing of the new Nurly Zhol state development programme, “The Walk Toward the Future”. 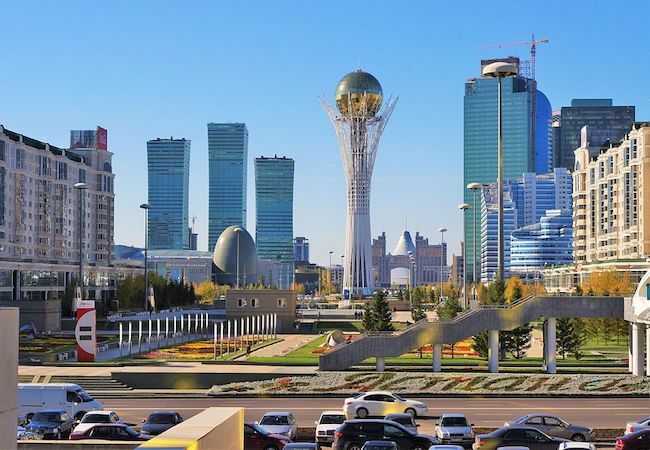 This programme, which aims to modernize the infrastructure and internal transport apparatus, also in view of the Expo to be held in the very modern Astana in 2017, intends to encurage foreign investments in transport / logistic and industrial / energy sectors so as to make the Country more efficient and in step with the interconnection processes developing both on a global level and in the “Euro-Asian” strip. The Expo event is bound to contribute to giving gloss to the capital representing the perfect synthesis of modernizing processes launched in the last two decades as well as the last in the utopian cities chronologically. Astana, bearing the signature of Japanese architect Kisko Kurokava with collaboration from artists and intellectuals, was devised to represent, despite its distinctive Winter temperatures, the perfect city of the future model and celebrate the growing power of Kazakhstan. A revolutionary city that expresses the vision of its its planner, man dominating nature, and also embodies environmental sustainability principles, breaking with traditional city structures. Astana was indeed planned and created in sectors, putting the zones in a row starting from the industrial one, located around the station so as to exploit transport possibilities, following with residential areas, with parks and gardens, with the government’s administrative ones and the diplomats’ zone. As well as Astana, Kazakhstan also dares on the maritime transport megastructures, suggesting a “Euro-Asian channel” so that its ships, starting from the Caspian Sea, can reach the Black Sea and from there, via the Bosphorus, the Mediterranean. Should this proposal become reality, it could turn the Country, thanks mainly to its geographical position and its constructive big neghbours, into the great “Euro-Asia” logistic platform, a great centre to shift products and services and attract investments located in the golden “heart of the world”. Filippo Romeo is the Director of the “Infrastructure and Territorial Development” Programme, IsAG Rome. Why was Russian ambassador killed in Turkey?